Cozy love nest for a young couple without “prettiness” and flower patterns? It is easy! Is it possible at all to create the loft design with only 80 square meters of a standard apartment? Nothing is impossible! Nothing is impossible when the youth and courage meet the creative design. The new life for the small standard apartment in Minsk began a couple of years ago when Artyom – the current owner – decided to start his family. He kept the image of the renovated apartment in secret from his wife-to-be Yulia, willing to amaze her. Therefore, his parents who have the broad experience in housekeeping inspected the apartment thoroughly. It might be the reason why the apartment got the slightly bachelor-like appearance, and at the same time acquired the maximal functionality. The project turned out to be quite challenging: the very essence of the loft that came to us from the United States with its vast spaces, French windows and industrial style had to be adapted accordingly, and the standard apartment had to be turned into the huge studio. First and foremost, it was necessary to expand the space; that is why the apartment layout was completely changed. Not only spare walls were demolished, but also some interior details, which fractioned the interior. Doors, for instance, were fitted into the walls – it is almost impossible to find them. Furniture makers’ skills were just in time to create doors with hidden hinges according to the designer drawings. There are no handles on commodes – they are opening when pushing slightly. There is no chandelier in the living room too: the spotlight is enough. Such small, almost invisible design tricks make the interior very lapidary and well balanced. Ceilings in Minsk apartments are not that high comparing to New-York “fellows” located in industrial premises. The designer did not do without some tricks here as well: the glossy ceiling that extends the space visually allows the apartment “breathing”. Loft usually anticipates the open space and freedom, and at the same time the galore of different decorative elements: art objects, books, design tricks. These things look perfect in vast industrial buildings, but it was necessary to find the perfect balance 80 square meters. The only solution was to combine open and closed storage areas. Only elements that bring a certain message can be seen, the rest is aptly hidden. Well-considered storage areas are the biggest functional advantages of this apartment. No open shelves at the kitchen: kitchenware is stored in big drawers, which can be found even under the dinner table. The separate drawer found its place in the bathroom too. Drawers under the bed easily accommodate all bedroom accessories. All elements in such an interior stand out. Standard furniture became real art object: stylistically deviant transportation boxes became drawers and commodes, nailed wooden beams are used as chests for different equipment. Black-and-white street photos that are the distinctive feature of any loft can be found here as well. This feature is extended and gets the local flavor: the whole wall bears the image of the old fire station on Nyamiha. The owner himself found the photo subject. To put it on the wall, not only the photographer, but furniture makers also had to make certain efforts: the image was printed directly on wooden panels of doors and walls. 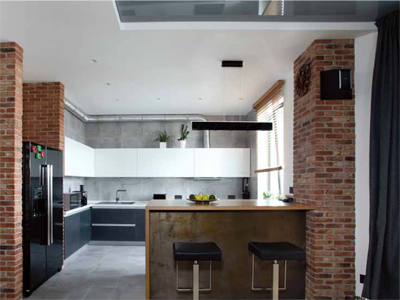 Brickwork, grey walls, open kitchen hood duct, concrete-like kitchen tile, metal bar counter – all these elements of the industrial style set the tone to the apartment, giving the sensation of non-conformist and rebellious spirit, bravery and creative work. Р.S. The idea, by the way, was greatly appreciated by the wife-to-be, and her small library and lovely things fit in the interior perfectly. 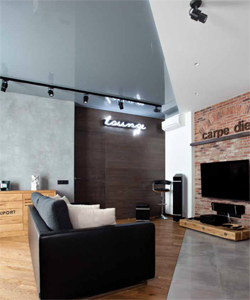 Designer’s (Andrei Basalyga) commentary: We agreed on our visions of the interior: the homeowner dreamed of the modern design, and I was eager to try myself as a loft designer. I am happy because we managed to avoid any “prettiness” that could spoil the apartment. We have no flower-pattern curtains, cozy bolsters and gaudy chandeliers. Modern cutting-edge equipment fit in the brutal interior perfectly; everything is looking natural and congruous. The apartment is quite small, that is why it was necessary to keep the stylistic uniformity in every room. Metal face of the bar counter is repeated on bedroom shelves; the wood is used not only for flooring and furniture, but for windows and blinds too. 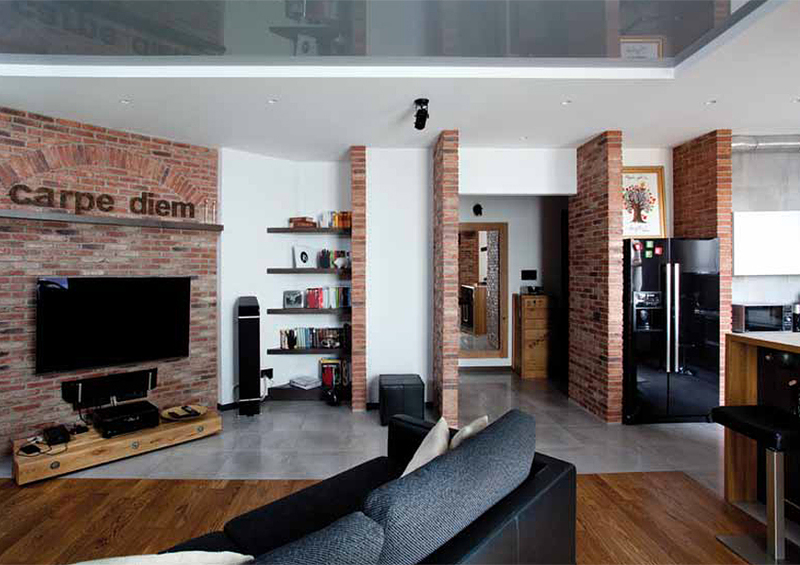 Concrete-like tiles can be found on grey areas of walls.